I seem to have an abundance of dried flowers right now…I collected a bunch a while back and ever since, I’ve been coming up with ways to incorporate them into my home decor (see last week’s wall decor DIY). Then it occurred to me that I could use them to make potpourri! The last time I remember having potpourri in my home was when I was little and still lived with my parents, but I always loved how pretty it looked. As I was researching how to make it, I realized that there’s actually so much experimentation you can do with this project depending on what kinds of flowers, herbs, spices and oils you decide to use. It’s so much fun and in the end, you’re left with a great-smelling home! 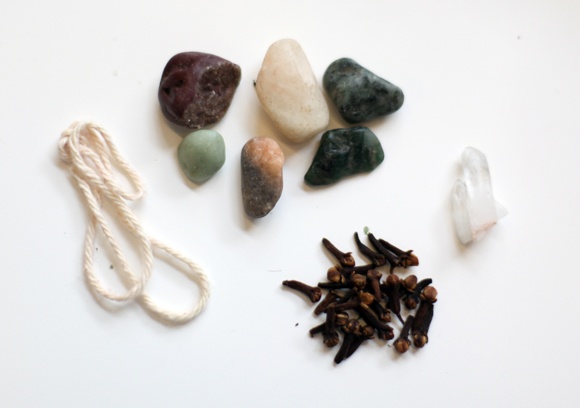 What you need: dried flowers, essential oil, and any herbs, spices or other trinkets you want to include. Have fun with it! Choose things you love. 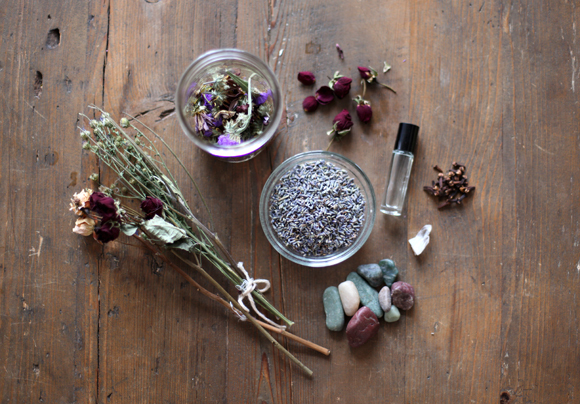 For my first batch I used dried flowers, lavender, lavender oil, cloves, and some rocks for a decorative touch. 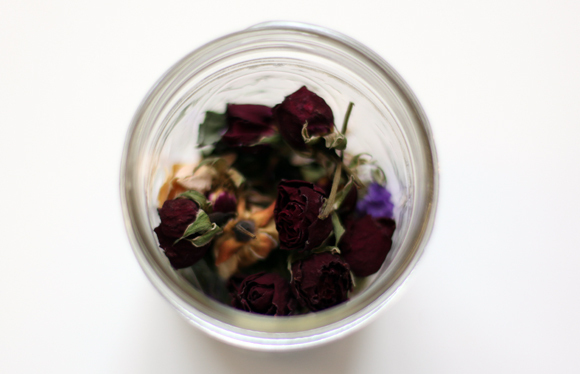 Prior to making your potpourri, you’ll need to dry out your flowers. Gather a bouquet and tie the stems together with some twine. Hang them upside down and give them a couple of weeks to fully dry out. Once your flowers are dry, put them in a container and add a few drops of essential oil. It’s recommended that you close the container and allow the flowers to absorb the oil for a couple of weeks. For the first batch I loved the idea of arranging the potpourri in a decorative bowl. 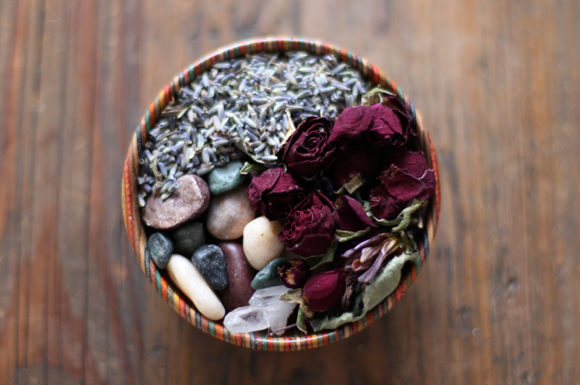 I loved how the dried rosebuds looked with the stones and I added in a crystal for a decorative touch. To complete the scent I added more lavender and some cloves, which gave the aroma a nice kick. 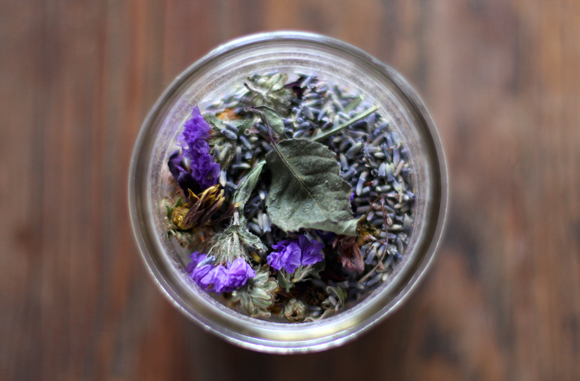 For the second batch that I made, I actually just used everything I had left over: the rest of the dried flowers, lavender, rosemary and cloves. I dumped it all into a mason jar and it had such a lovely fresh scent! Tie a bow around it and you have a great birthday gift or something sweet for a loved one :). genius. i’m heading out straightaway for the closest meadow! love it! Really love this week’s DIY. Reminds me of when I was a kid, when I made potpourri jars with my godmother and we would put potpourri in jars with christmas lights – It would look so pretty. I have a ton of dried flowers that are waiting to be used. Now I finally have something to do with them! Merci pour les fleurs séxhées et la belle présentation, j’adore !!! I’m going to do this project straight away!!! Oh, and what kind of essential oil do you recommend? Thank you so much! I’ve been wanting to give my mom something for Christmas, but I have no money! I’ve been searching DIY projects, and this just might be the one! Thanks! When making the potpourri, what gives it the scent? The lavender oil or thebflower petals themselves? (I’m not a huge fan of the scent of lavender.) Are there other oils you can use? Thank you so much! 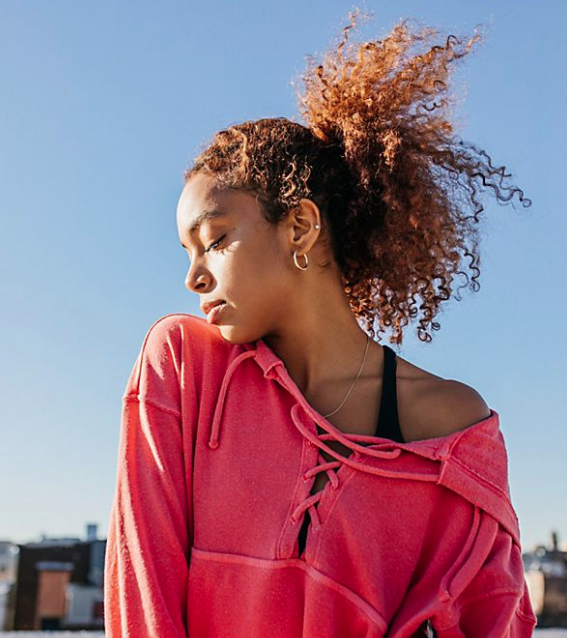 I love this DIY, it’s perfect for Spring! Thanks am learning to make potpourri,,,this is helpful. This looks such beautiful. 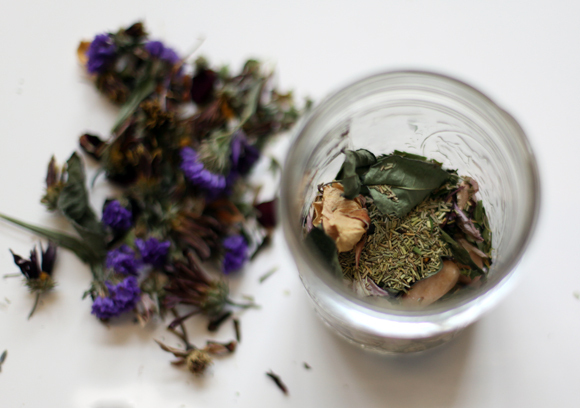 Really into try this potpourri DIY tutorial out. Lovely DIY. Thank you for sharing.